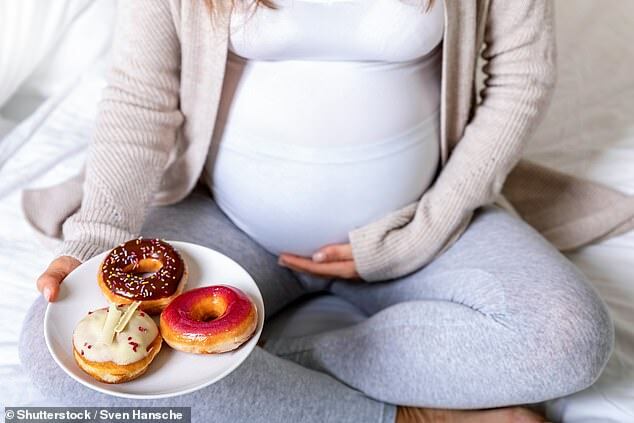 Pregnant women who eat a diet high in fat and sugar could have children with heart problems, a new study finds. Researchers say that, in a study conducted on mice, mouse mothers who ate an unhealthy diet before and during pregnancy had offspring with weak hearts. Surprisingly, these health issues lasted for at least three generations, even if the younger mice were not obese and ate a diet of standard mouse chow. The team, from the Washington University School of Medicine in St Louis, says its findings show how important it is for women to maintain a healthy weight both before becoming pregnant and while pregnant. Researchers found that most of the children of obese mouse mothers had an increase in weight of the left ventricle, which pumps blood out of the heart. In humans, excess left ventricle weight is often a sign of a weak heart muscle, which can lead to heart failure. Additionally, the team found that the heart problems were less evident in the female offspring of the younger generation of mice. ‘The cardiac abnormalities seem to dissipate somewhat over the generations, which is intriguing,’ said co-senior author Dr Abhinav Diwan, an associate professor of medicine at Washington University. To see if the problem was with the obese mother herself or her reproductive system, the team implanted fertilized eggs from obese mice into normal-weight mice. However, these offspring had the same heart problems, which shows the health issues were from the egg and not from environmental factors. The team also found that these heart problems were not just passed down to offspring from their mothers. Researchers saw that the obese mothers’ male children, who mated with females fed a standard chow diet, had children with the same heart problems. Changes were specifically seen in mitochondria, tiny ‘power stations’ that fuel cells. This was surprising because, at least in humans, all diseases inherited from mothers are mitochondrial disorders, according to the United Mitochondrial Disease Foundation. This is because mitochondrial DNA is only passed down from the mother. ‘We know that obesity in pregnant mothers raises the risk of future heart problems for her children,’ said co-senior author Dr Kelle Moley, a professor of obstetrics and gynecology at Washington University. The team believes that the problems with heart mitochondria are due to epigenetic changes in the DNA of the eggs of obese mothers. Epigenetics is the study of inheritable traits that are carried outside the genome. They believe that these changes are then carried into the cell of all offspring, male or female. The researchers plan to begin new studies soon, but stress that women must follow a healthy lifestyle before and during pregnancy. ‘A big question that people may have is: “What can I do if my grandmother or great-grandmother was obese?”‘ said first author Dr Jeremie Ferey, a postdoctoral research scholar at Washington University.